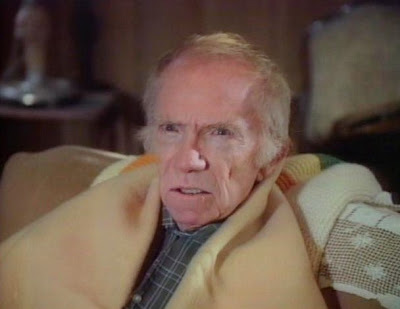 John Kenneth Muir's Reflections on Cult Movies and Classic TV: Friday the 13th: The Series: "Tales of the Undead"
Friday the 13th: The Series: "Tales of the Undead"
“Tales of the Undead,” a first season installment of Friday the 13th: The Series, is likely my favorite episode of the entire series. In part, this is so because the episode -- while being a crackling good horror tale – also speaks a lot of hard truths about the worlds of comic-books and science fiction fandom. Specifically, those talents who create characters and stories that millions love aren’t always rewarded financially in the way they should be, and spend their final years in poverty and desperation. It’s a sad fact of life. 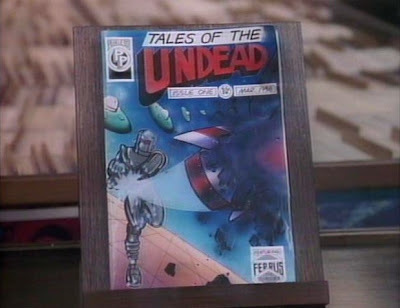 In “Tales of the Undead,” a determined comic-book fan who loves the classic character “Ferrus the Invincible” (think Rom: The Space-knight), steals the ultra-rare first issue of the comic-book, which would sell at auction for twenty-five thousand dollars. 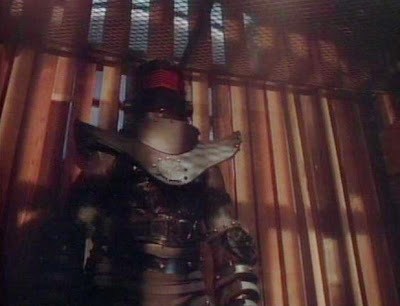 During this act of theft, the young man grabs the comic-book issue and suddenly transforms into Ferrus, a malevolent, indestructible robot. In that form, he kills the comic-book store owner, a kind of live-action version of The Simpsons character, though this character probably precedes him by a year or so. 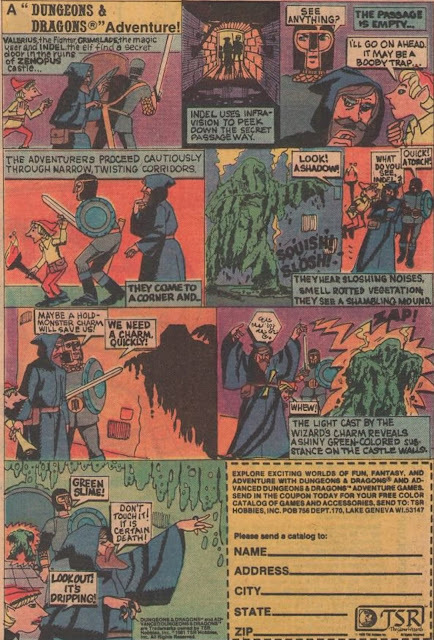 Ryan witnesses the violent act and traces the cursed comic-book back to Ferrus’s creator, Jay Star (Ray Walston), who has fallen on hard times and has become a bitter recluse since he first created the character in 1947. 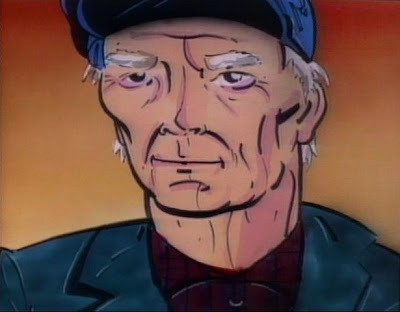 After the character Ferrus built the empire of Peerless Comics, Jay was shoved aside by corporate politics and his beloved creation was taken away from him. When Star learns that the cursed comic-book can turn anyone who holds it into the indestructible Ferrus, he realizes he must possess it, himself. This is especially so because he is succumbing to arthritis and a heart condition, and can no longer afford medication. By becoming his own indestructible creation, he gets a second chance at life. Although the technique used is not expensive, I love how “Tales of the Undead” depicts the transformation from mortal man to monstrous machine. The screen transforms into comic-book frames as the transformation occurs, and we watch the entire sequence in illustrated form. 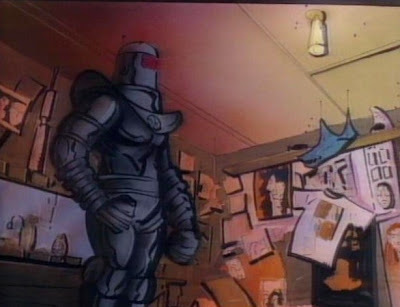 The murders are also depicted as excerpts from a comic-book, and thus this episode gives once the chance to visualize Micki and Ryan in that form. Some of the visual compositions in this episode -- in both illustration and video form – strongly echo familiar comic motifs. My favorite image finds the colossal Ferrus emerging from an elevator, a slain enemy at his feet. Beyond the non-conventional visualizations of the action, “Tales of the Undead” works remarkably well as a human story, and in fact, one of the most “human” stories of the canon. A budding illustrator himself, fanboy Ryan holds Jay Star up as a hero, only to learn that he has clay feet. His hero worship turns to sympathy and pity when he learns that Star has become weak and bitter with age and because of desperate conditions. There’s something very powerful about this particular relationship, and Ryan’s slow realization that Jay Star, though incredibly talented, is as human and fragile as he is. I mentioned above how the episode lingers on the idea of an artist dwelling in a kind of financial and creative exile. We have seen this happen again and again in Hollywood, and in the comic-book world too. Inevitably, it seems that one partner in a beloved collaboration ends up with the lion’s share of the credit, or with the fame, while the other slowly disappears from sight. Great works of art have also been taken out of their creator’s hands frequently by business interests, and of course, “Tales of the Undead” explores that truth as too. In all, it’s a much more nuanced approach than the “cursed antique of the week” premise may suggest. Finally, the episode is enhanced greatly by Ray Walston (1914 – 2011) one of cult-tv history’s greatest treasures. Walston starred in My Favorite Martian (1963 – 1966), and The Magician (1973), and made the cult-tv rounds as a guest star on programs as diverse as Buck Rogers in the 25th Century, The Evil Touch, and The Incredible Hulk. Walston makes the interesting acting choice in “Tales of the Undead” not to play Jay Star up for sympathy or pity. Instead, he ramps up all the darker emotions, namely rage and bitterness. And yet, in part because of Walston’s frail physicality partly because of his incredible, raspy voice, the character nonetheless gains our sympathy. He wants what we all want: more life. “Tales of the Undead” came early in the Friday the 13th: The Series run but it stands out as one of the very best episodes of all.